Jae Chung, a Master of Divinity student at General Seminary, has written a moving appreciation of a new translation into Korean of Emeritus Professor J. Robert Wright's Ancient Christian Commentary on Scripture, a volume on Proverbs, Ecclesiastes, and the Song of Songs. The series is a post-critical revival of the early biblical commentary tradition among the early Church Fathers and Mothers known as the glossa ordinaria, in which commentators on Scripture would interpret the meaning of a word or text in such a way as to encourage theological reflection and spiritual reading. For each volume in the series, an editor with a deep knowledge of the writings of the Church Fathers and Mothers chose the material to present, translating, shaping, annotating, and introducing it for today's readers. First published in 2005 and hailed as a significant accomplishment, Wright's volume in English has sold over 18,000 copies. The work has been translated into Italian, Spanish, Russian, and as of this winter, Korean. "When I began to introduce the set of Ancient Christian Commentary on Scripture to other Korean seminarians, they were all thrilled by the pleasure of access to patristic commentaries on the entire body of Holy Scriptures. In Korea, we have had many books that have been written about the early church fathers, but we have had limited resources for their own writings that were translated reliably into Korean. "Thus, the Roman Catholic Church of Korea established, in 2002, the Institutum Patristicum Coreanum (IPC) for researching patristic writings and publishing such books, and the full 30 volumes of Ancient Christian Commentary on Scripture have become the biggest project of the IPC. I am pleased that the volume on Proverbs, Ecclesiastes, and Song of Solomon is the contribution to this series by our esteemed church history professor emeritus here at GTS. 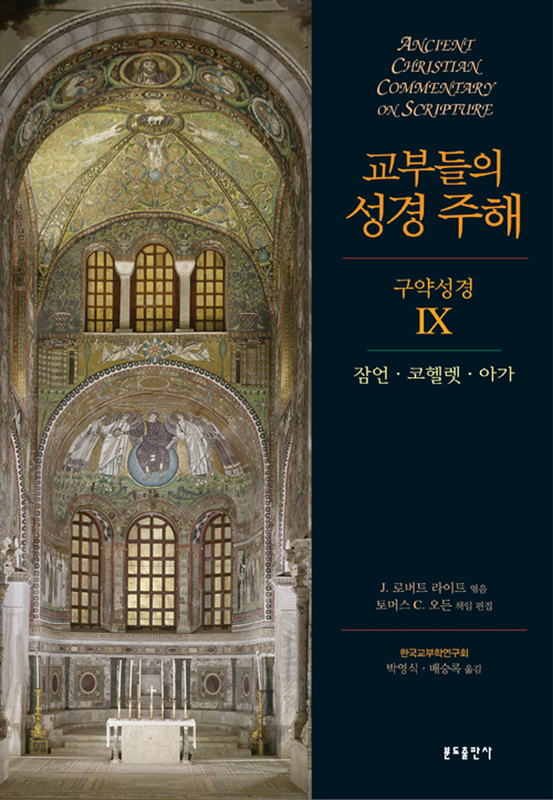 "Whereas most volumes in this series have been translated by only one person, Wright's volume (OT IX) has been translated by two Korean scholars, including Johan Yeong-sik Pahk, S.S.D. Pahk received his S.S.L. and S.S.D. from the Pontificio Istituto Biblico. Heis a member of the Pontifical Biblical Commission at the Vatican and currently the president of the Catholic University of Korea. The weight of his name in Korea indicates the great significance with which Wright's volume is being regarded. "For myself, I really appreciate not only Pahk's scholarly depth, but also his writing in Korean. His translation flows like original writings in Korean and manages to deliver all the Scriptural meanings beautifully and intelligibly in one of the most ambiguous languages. "I am deeply glad to find one of Dr. Wright's masterpieces in the Korean language. It has been a great honor to learn and study under his guidance here in the General Theological Seminary." To learn more about the English version of the volume on Proverbs, Ecclesiastes, and the Song of Songs, click here.